The 1915 Chevrolet 490- aimed right at Ford's Model T which was priced at $490. Apple Pie, Baseball, Dinah Shore, USA, Route 66, Drive-In Theaters, Diners, the Hot Dog. All of these words can conjure up thoughts and talk about our first or favorite automobile and where it was purchased. 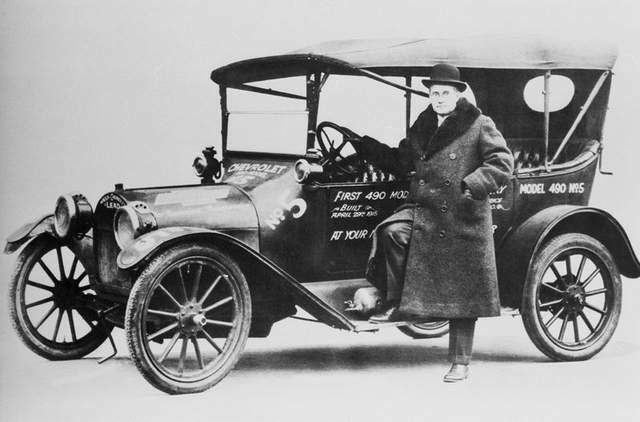 Chevrolet has sold 209 million automobiles since the brand was founded 100 years ago by Louis Chevrolet and William Durant. 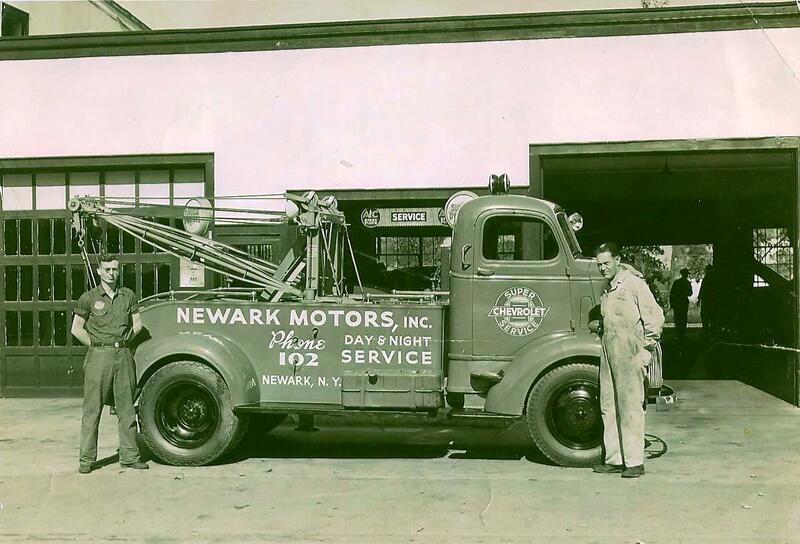 And through thick and thin, depression and prosperity, two World Wars, Newark has always had a Chevrolet dealer. Chevy Runs Deep in Newark! Lewis Farnsworth owned a general store at the North Ward early in the 1900's and like many such stores, there was a blacksmith shop attached. 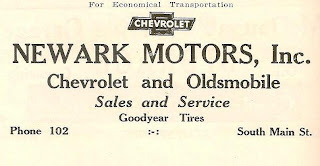 Farnsworth took on the franchise for Chevrolet and it was strictly a matter of looking at a brochure and ordering the 1911 Chevrolet. By the 1920's J.B. Martin, who had maintained a blacksmith shop on West Miller St., (Now Wayne Arts) built a new facility on West Union Street and sold Chevrolet Motor Cars until he left for greener pastures in Harrisburg Pa. where he had been awarded a franchise as a distributor for the Chrysler and new companion brands, the DeSoto and Dodge. 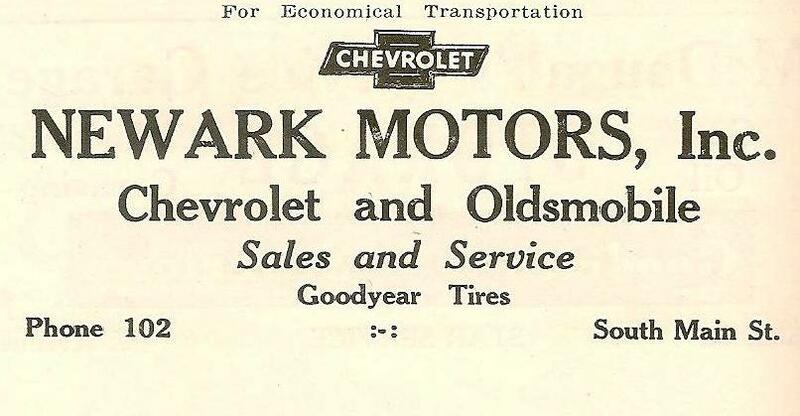 In 1927, young businessmen, Wiliiam R. Noonan and John D. Finegan took on the Chevrolet franchise and invested in a brand new building at 217 South Main Street. The building would be their home until about 1939 when they moved to 219-223 West Union Street and sold their South Main St. garage to be converted to an A & P Grocery Store. This would later be home to Finewood's Western Auto, Wayne Pharmacy and is now Ruffalo Appliance. At the West Union Street location William R. Noonan eventually became the sole owner and took on the Oldsmobile franchise as a way to move customers up to a more expensive make of car, and thus covered both ends of the market. Noonan faced the end of auto production after Pearl Harbor and survived the war by servicing all makes of cars and selling used cars that were precious commodities. 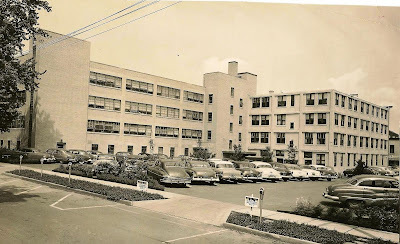 Photo-Chevrolet in Newark- 1942- 219-223 West Union St. - right portion of building is still standing as Rose City Glass. 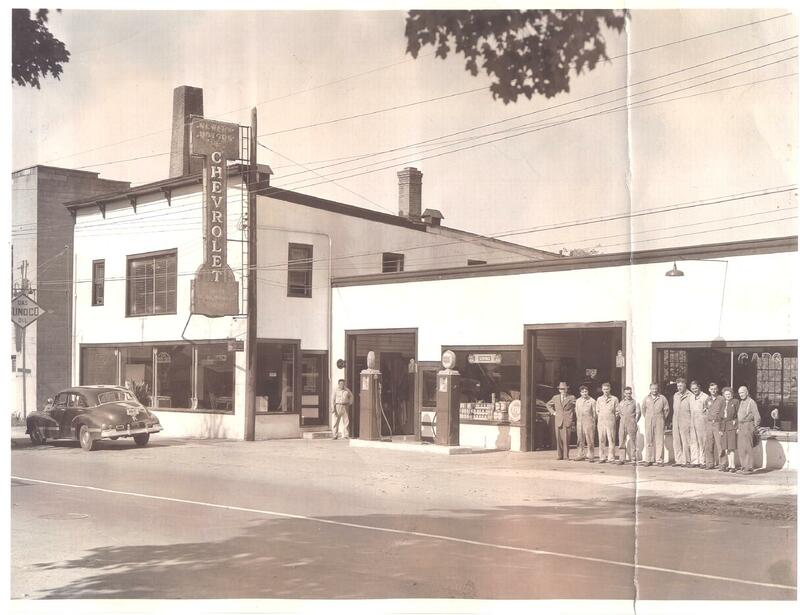 Pictured in front of the showroom was Mr. Noonan's 1942 Oldsmobile 98. William (Bill) Noonan went on to also own Wayne Chevrolet in Lyons and after the war took over a nearly new facility for his Chevrolet-Olds agencies on the New Lyons Road. Noonan died in 1956 and his son William Jr. had little interest in the auto business, preferring instead to become a well known stock broker in Rochester. Noonan Jr. put the business up for sale and it attracted a former Newark resident, Victor DePauw, who had a Chevrolet dealership in Macedon. He saw the Newark franchise as a better investment and arrived in Newark just as the new 1958 Chevrolets were being introduced. On his daily trip to Newark he noticed a large former International Harvester dealer building for sale across from Freddies Drive In. (now Tim Hortons) DePauw purchased it and sold Chevrolets and Oldsmobiles there for several years, eventually selling out to Kenneth Robie of Williamson who sold Chevrolets only. Well, that 100 years went by fast! And now Mike Barnard has entered his 31st year in the auto business at the West Union St. location and sold his share of Chevy's 209 million cars. He and Chevrolet have survived strikes, double digit inflation, gas shortages, and GM's reorganization. "Quality of Life" was not a catch phrase back in the fabulous fifties. The quality of your employment usually defined how you lived. Newark had a job for most everyone, but how you lived was dictated by how far you were willing to move up in Newark's many good companies. The century old C.H. Stuart Co., also known as the Commercial Building or just "the building," offered good, well paying jobs and a college degree was not imperative. One could still start at the bottom and move to the top. This applied to men only, of course. Those employed at the building supported our churches, clubs, fraternal organizations, Scouts, the PTA etc. Life was good. Even the parking lot at the Commercial Building told a story: If you were an executive, your Cadillac was parked nearer to the door. A junior executive probably had a Buick, and if you notice, entry level employees, driving Chevys or Fords ended up in the back of the lot. And that is the way it was, no one questioned it. 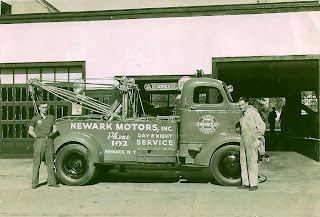 1 Comment to "Chevrolet- 100 Years in Newark"
Nice! I am a proud Chevy owner AND Newark resident.